Combine admission to the Royal Observatory Greenwich with a sightseeing cruise on the River Thames. Step inside the astronomical observatory to stand on the Prime Meridian of the World and experience the home of Greenwich Mean Time (GMT). Then see major London landmarks such as Big Ben and London Eye with a hop-on, hop-off river cruise. Your cruise ticket is valid for 24 hours and departs from four piers every 30 minutes. Boat ride was nice otherwise an uneventful trip - take it if you are looking forward to walking up a big long hill. The cruise alone was well worth the cost. The boat host was helpful in pointing out major sites along the way to Greenwich. Participants should understand it is a long walk to go all the way to the Royal Observatory. The trip down the river to Greenwich was a great way to see the city. The observatory is at the top of a steep hilll which offers a fabulous view of the river and the city. We straddled the Prime meridian, saw the telescopes and used the audio guides which helped explain the various exhibits. At the pier there is also a restored sailing ship and that is quite interesting as well. Definitely an excellent way to spend a day. the observatory was bear busy and quite an up-hill walk, but we did enjoy it. The river cruise was fun and both commentators to and from were funny and great. Fascinating spot to visit. I loved the trip on the river to get there. Should note that it is a bit of a hike up from the dock to the Royal Observatory so leave plenty of time to get there by foot. Beautiful walk though. Highly recommend a visit. Royal Observatory was great for historical scientific significance. 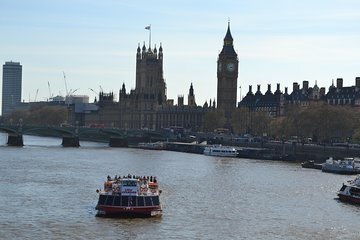 The Thames boat ride was a great way to get a beautiful view of London while hearing informative and humorous commentary from the guide. Very easy to find and get on board. There was a short line to turn in out e-receipt and get actual tickets, but no more than 5-10 minutes: no problem. The crew ad-libbed a guided tour of Thames River which we enjoyed. No stops between Tower pier and Greenwich. Lots to see and do in Greenwiich but didn't anticipate the steep climb up to the Observatory.